Happy Halloween! It's been a dark, rainy, scary one for me so far. I experienced some of the loudest thunder I have ever heard in my life last night. Heart-pounding thunder. Room-shaking thunder. I was scared for the majority of the night. It's looking as though it may happen again today. This may be terrible news for trick-or-treaters, but it does make it the perfect scary movie night for those of us who have to work early tomorrow morning. Speaking of tomorrow... that's when the real magic happens. That's when all the Halloween candy goes on sale! Bag of Almond Joys, here I come! I know this recipe isn't in theme for today, but what I lack in halloweeny spirit I make up for in .gifs! I posted one at the end of my last post and let me tell you-I'm .gif-obsessed! I can't stop making 'em! There are so many beautiful ones out there, I couldn't help but try my hand at it and I'm in love. So hold on tight folks, this will probably become a regular thing. So let's get on to the recipe so I can show some more of these .gif(t)s I made for you! Empanadas. Yes, they are a bit involved. They aren't something you would feel like making for dinner after a long day at work. However, they do make great leftovers and they aren't difficult to make, so this would be a great Sunday (or whatever your day off may be) recipe. Not only is the dough easy but the time it needs to rest is the perfect amount of time to make the filling. After your dough is rolled and cut, the filling should be cool enough to stuff and seal. Bake and save some to grab from the fridge throughout the week. 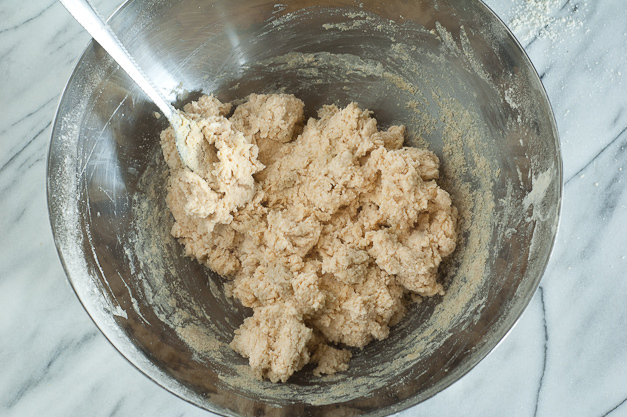 You could make the dough in a food processor, but I'm going to show you how to make it by hand. First sift the flour and salt and combine in a large bowl. Remove the butter from the fridge and cut into 1/2-inch thick cubes. Whisk the egg in a separate bowl-set aside. Toss the cold butter into the flour and break it up with your hands until it reaches a coarse sand-like texture with a few pea-size pieces. Add the egg and combine with a fork. Add vinegar, ice cold water, and mix until a dough forms. After you've let the dough rest for about an hour, dump on a floured surface and lightly knead-do not over work the dough. Let it sit for a few minutes and then divide the dough and roll each piece to about 1/8-inch thick. 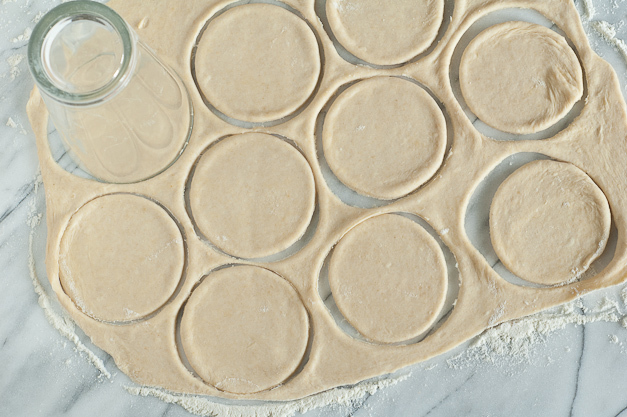 Cut into circles, then fill, seal, and bake. But don't forget the most important part! 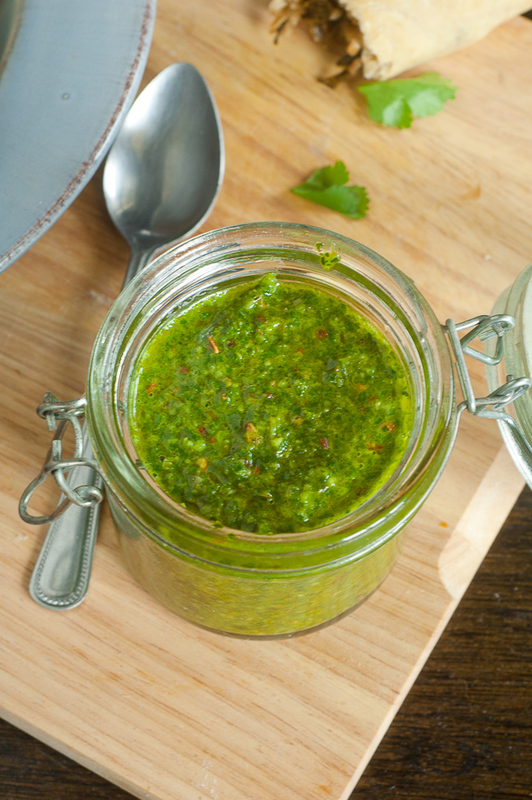 This delicious cilantro chimichurri. This stuff is typically heavier on the parsley side, but I always preferred a heavy cilantro chimichurri. Make this first and let it sit in the fridge while you make the empanadas. 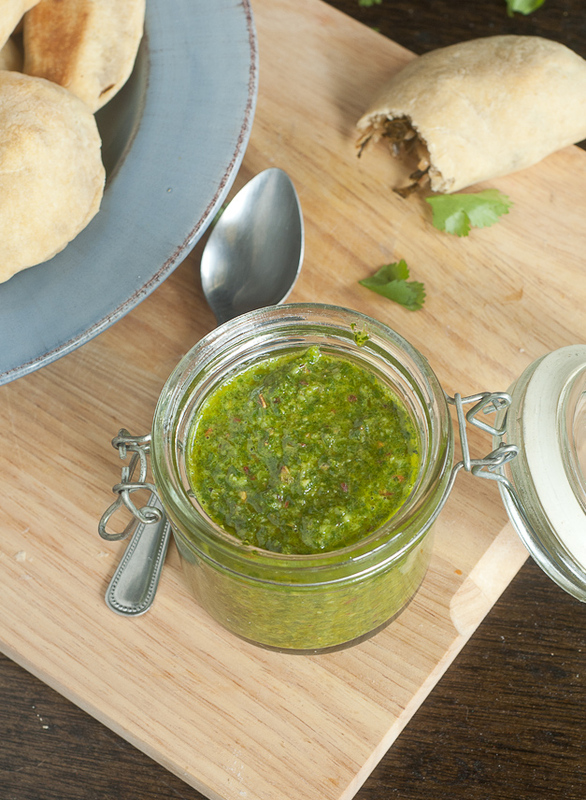 This chimichurri goes great with just about anything so a jar of this in your fridge will definitely make for a yummier week. To make the chimichurri- pulse fresh herbs in a food processor to chop. Add remaining ingredients and blend. 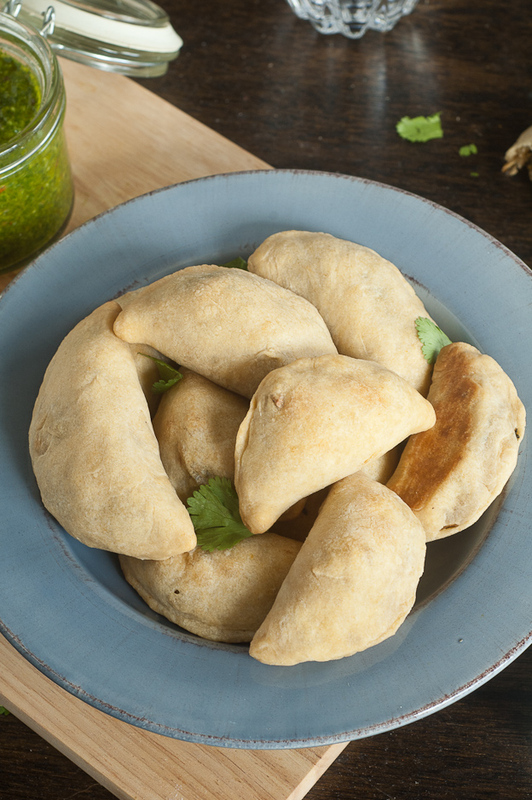 Store in the fridge while you prepare the empanadas. 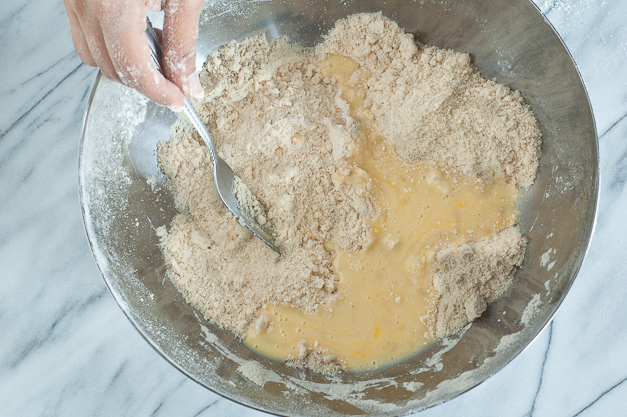 To make the dough-In a large bowl, sift the flour and salt together. In a separate small bowl, whisk egg with a fork. Add cold butter to flour and break with hands until it resembles coarse meal. Add the egg and combine with a fork. Add the vinegar and ice cold water- You may not need all the water! Sometimes when I'm using more wheat flour than all purpose- more water is needed to get the right consistency. 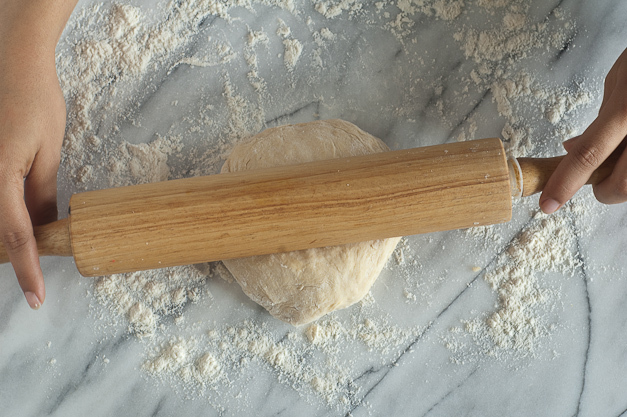 Your're wanting the dough to come together, but not be sticky.Toss dough onto a floured surface and lightly knead- do not over-work the dough. Just work it enough to form a ball. Wrap in plastic wrap and leave for an hour. 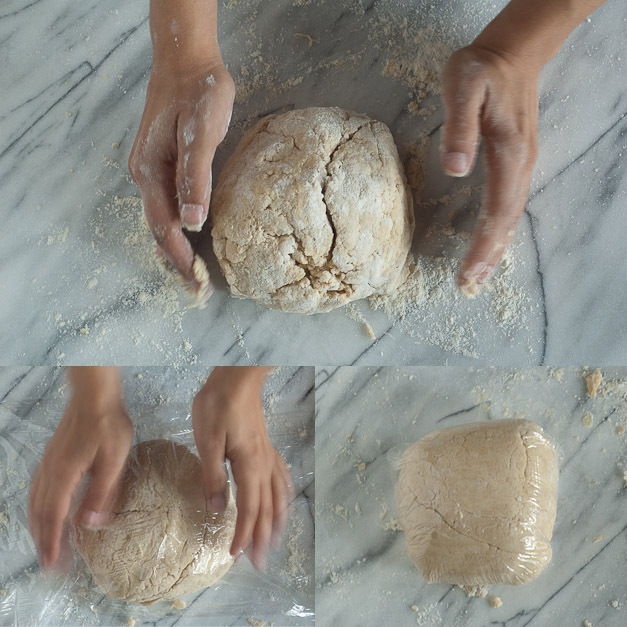 When an hour is up, lightly knead dough on a floured surface and let it rest for about 5 minutes. Divide and roll each piece to about 1/8-inch thick. Cut into circles -size depending on what you have to make circles with. Fill and press the ends together to seal. You could also use egg wash to seal and wash over the tops of the empanadas- it gives it a nice shine. To make the filling- Preheat oven to 425. Place diced sweet potato onto a baking sheet and drizzle with olive oil to coat. Season with salt & pepper. Make sure the sweet potatoes are laid out evenly and roast for about 35 minutes- tossing after 20 minutes. Heat 2 tbsp olive oil in a cast iron skillet over medium-low heat. Cook onion until it's soft and a bit translucent, about 5 minutes. Add garlic and spices, stir to combine. Add beans and cook for an additional 5 minutes, stirring occasionally. Add chopped kale, stir to combine, cover and cook stirring occasionally for about 5 minutes. The kale will cook down some but the color will be more vibrant. Stir in roasted sweet potatoes. Remove from heat. Season with lemon juice, salt & pepper. The filling is really simple but so good! You will have some leftover, but it makes the perfect lunch. Preheat oven to 400 and bake empanadas for 10-15 minutes, until they are light golden brown. 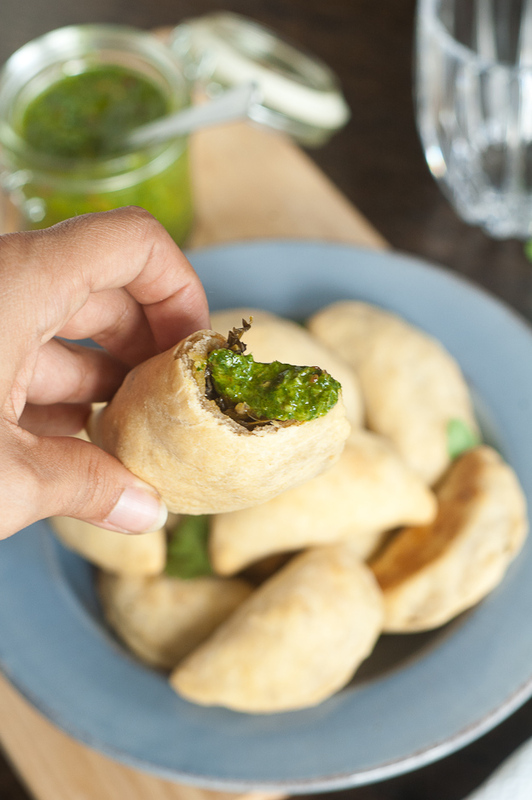 Serve with chimichurri and enjoy! Omg. Is this heaven? Girl, I haven't visited your blog in FAR too long. I am just. Speechless. These are EXACTLY what I want to eat (sweet potato PLUS kale PLUS empanada dough?? Swooooon.) and your photos are perfection!! Okay you must tell me how you made those gorgeous .gifs. How did you get the blurred effect with the fork? Did you use a tripod to take those photos? Sadly, any kind of dough that requires working butter into it is one of my least favorite items to bake, but I would definitely tough it out for these. I'm betting they're at least as awesome as your arepas (omg now I want some of those again) so I am definitely bookmarking these for dinner soon!! Also! Are you doing the cookie swap again this year?? Thank you so much, Erika! I made the .gifs using my tripod and remote. (picture me with a camera remote in my mouth, whisking eggs, and using my lips to press the shutter button. yes, i looked as goofy as it sounds and yes, i did drool on myself.) Then I put the pictures together using ps elements to create the .gif. I can't stop making 'em now! I totally understand your hesitation with the dough. I have to remind myself not to overwork it and just mix to combine. I'm so so so sad I missed the sign-up date for the cookie swap by one day!! I really want to do it again this year but it's probably for the best since I'll be out of town during the deliver-by and post-by dates. How bout you? p.s. awww... it's almost 1 year since we became blogging buds! Hahaha you are amazing! That sounds like an incredible balancing act. Aww sad you missed the sign up but yeah that would probably be a little stressful if you had to juggle traveling + baking and sending cookies! Not to mention stale cookies in the mail would be super sad!